L200 Series 5, the pick-up truck perfected, it's the most accomplished pick-up truck Mitsubishi has created. After 33 years of refining the ultimate pick-up, Mitsubishi present to the world a truck for the future, built upon the same DNA that made previous generations so successful. With a turning radius of just 5.9 metres, improved steering ratio and a brand new MIVEC engine, the L200 Series 5 is the only pick-up with variable valve timing, the all aluminium diesel engine in the L200 Series 5 weighs 30kg less than Series 4, and is the most efficient and powerful ever in an L200. The most dynamic driving pick-up truck on the market. With unrivalled aerodynamics the L200 Series 5 delivers oustanding performance, acceleration and torque. With Mitsubishi's unique Super-Select 4 wheel drive system the L200 is the only pick-up that can be driven in 2WD or 4WD on any surface including tarmac. Driving in 2WD gives fuel saving efficiencies, while the 4WD mode provides better traction in wet or slippery conditions and more stability when towing. The L200 Series 5 is more fuel efficient than ever and can save you hundreds per year. Capable of over 700 miles on a single tank of fuel, the L200 Series 5 takes you farther than ever before with a brand new MIVEC diesel engine that doesn't sacrifice power or efficiency. L200 Series 5 has amongst the lowest CO2 emissions of any pick-up truck on the UK market, safeguarding you against future emissions-based tax regimes. The L200 Series 5 has a total load capacity of 4,090kg, more than any competitor and is equipped with Trailer Stability Assist making towing safer than ever. The new L200 includes the most comprehensive range of safety features available on any pick-up truck. Including: seven airbags, emergency stop signal, hill start assist, trailer stability assist, adjustable speed limiter, lane departure warning, Bi-Xenon headlights and LED daytime running lights in addition to Mitsubishi’s Active Stability and Traction Control (M-ASTC) and Anti-LockBraking System. The L200 Warrior offers a choice of all-new 6-speed manual gearbox, more responsive than ever, or 5-speed automatic with paddle shifters for a relaxing responsive drive whilst the paddle shifters giving you the option to take control. 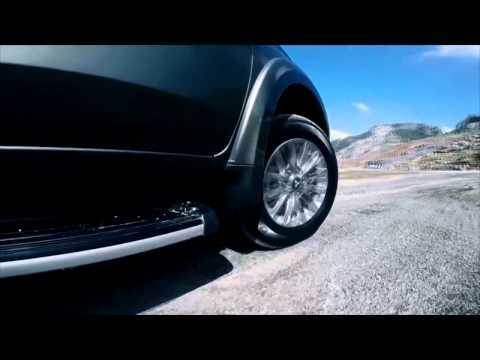 Not just the best driving driving pick-up Mitsubishi has ever made, but the best equipped too. Well-designed and well-equipped are not words normally associated with a pick-up but this is yet another area where the L200 shows its class. Always perfectly combining comfort with practicality there’s a level of specification to suit your needs precisely, as well as an enormous range of accessories from which you can cherry pick.